Here we are in December already! Can you believe it? I can’t. Weren’t we all just complaining about the heat? Pretty soon we’ll be shoveling the walkways…oy. We have a couple of holiday parties coming up. The first one is an ugly Christmas sweater party. Here is the shirt (he wouldn’t go for a sweater) that I bought for my husband to wear. Funny eh? I wanted to bring something with us to the party that was healthy. You know of all the food allergies we deal with here right? 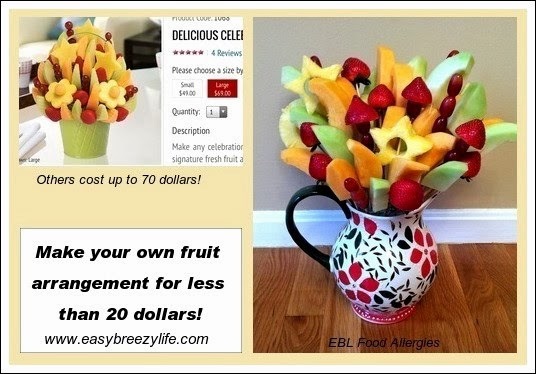 Well, I checked the website of our local fruit arrangement store and the arrangement that I wanted was $69.00!!!! Seriously? It’s just fruit! I knew that with a little time I could make a similar one, and that’s just what I did! The total for all the items needed was only $18.22. That’s a difference of over$50!!! I cut the foam to fit inside of the vase I chose. Then I used all of the scraps and shoved them inside to hold the foam tightly against the inside of the vase. Wash all of your fruit and allow it to dry. Slice each melon between the ends, and scoop out all of the seeds. Slice each half into slices like shown below. Holding your knife against the cutting board, slice the peel off the melon. Be careful!!! Each time I sliced a piece of melon, I inserted the wooden skewer and pushed it into the foam. 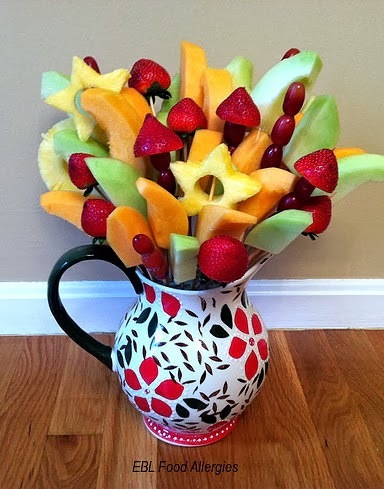 I continued doing this with all of the fruit until the vase was full. What do you think? Looks pretty darn good, doesn’t it? The best part is that it didn’t cost $70! « CDC Food Allergy Guidelines: Who Are They Really Protecting?